In this ongoing Monday Series we will be exploring various artists versions of Bob Dylan song's. 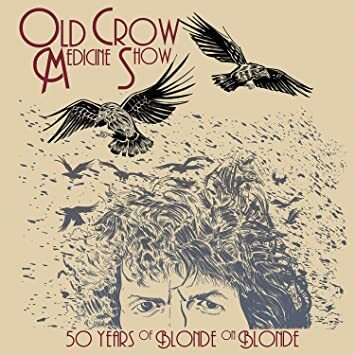 Today's artists, Old Crow Medicine Show doing a live cover of "Absolutely Sweet Marie"
Color me shocked that we are 36 covers into this series and just now we are getting to someone covering "Absolutely Sweet Marie". The original was one of the most complete songs Dylan has written even if you are never quite sure what he is addressing. He likes the song but surprisingly never played it live until 1988, I find that kinda odd. Tight taught and still somehow allusive, pretty cool and totally Dylan at his finest and a real Blonde on Blonde jam. Last week we could not get into the groups take on "Visions of Johanna". This week however the stars align and it makes sense as the upbeat exuberant number is much more in the bands wheelhouse. The real great steel guitar runs, the constant drumming, the party time vocals all work and even withe the sometimes odd lyrics the band hits the mark here.